Ninety percent of patient interaction is with primary care services. Seventy percent of carers come into contact with health professionals, yet health professionals only identify one in ten carers with GPs, more specifically, only identifying seven percent. 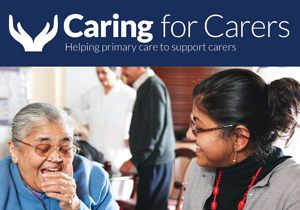 With this in mind, the Royal College of General Practitioners (RCGP) have developed the Caring for Carers Hub https://caringforcarers.info/ a web based tool that can make supporting carers easier and more time-efficient for primary care staff. The Hub provides information to staff working in primary care to help them to help carers focus on their own health and wellbeing, whilst they look after someone else. Each CCG or locality that signs up will have its own Hub. The Hub contains generic national information, managed by the RCGP, alongside information that you can manage, about local services, support groups and resources to support carers in the local area. The main audience is staff working in primary care, including GPs, nurses, practice managers and reception staff. All professionals that use the Hub will have the same information which will help ensure a consistent approach to supporting and signposting carers across the locality; thus contributing towards tackling health inequalities. Effective use of the Hub has the potential to reduce the number of consultations needed for the person with care needs and their carer, as carers will have the support network they need to be able to care whilst looking after their own health and wellbeing. Effective use of the Hub has the potential to reduce unplanned hospital admissions for the person with care needs as the carer will be supported to keep provide care at home. All users of the Hub across England will have access to the same information, which will be maintained by the RCGP. This has the potential to stimulate shared learning between CCG carer leads and health professionals across the country about how to provide support for carers. To register your interest in developing a Caring for Carers Hub in your local area please email us at supportingcarers@rcgp.org.uk or telephone 020 3188 7615.